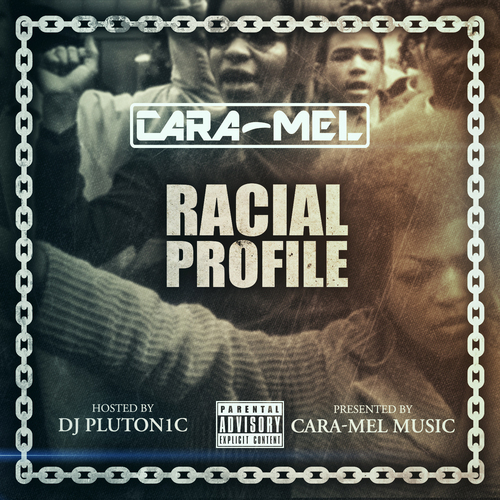 Cara-Mel’s current mixtape, Racial Profile, begins with Music Diary. This track is hard-hitting, with a particularly evil sounding backing beat setting the stage for the rest of the release. Cara-Mel is able to tie together influences including Lil Kim, T.I., and MC Lyte. The repetition used for the chorus ensures that listeners will be sitting on the edges of their seats. Welcome 2 My City benefits from a trap-infused backing beat and a rapid-fire fly from Cara-Mel. Listeners will need to spin the single multiple times before hearing every nuance included here. Back To The Grind is one of our favorites on Racial Profile. The atmosphere that is created through the loud and haunting production makes for a track that will be bouncing around listeners’ heads long after the effort ceases. Broke (I’m Tired) features D-Law & Metal Monk and is the track that is needed to keep the mixtape’s momentum high as fans move into the second half of the release. The dynamic established between the trio showcases a much different side to Cara-Mel than had been previously shown. As a result, the single is a “must listen” for anyone that is trying to learn more about this performer. No Justice No Peace shatters the conception that performers put their weaker efforts towards the end of the albums. The track has a laser focus; the flow laid down works perfectly with the beat to make for a song that is lyrically hard-hitting while musically catchy enough to keep listeners on the dance floor. Racial Profile begins strong, moves into bold new territories with songs like Racial Profile and Reflects, and ends with the powerful one-two of Won’t Shut Me Down and No Justice No Peace.